This lovely three stone ring has a beautifully hand carved flower and petal design along the top and sides of its flat edges. 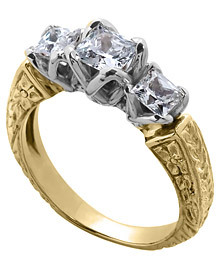 The setting can hold a center diamond of various sizes. As the center diamond changes, the side stones will also change. If you choose a center diamond ranging in size from .65 carats to .75 carats, two princess cut side stones, measuring .375 carats each, will be set into the elegant trellis settings. All side stones have a color of G-H and a clarity of SI. Please see below for more center diamond sizes.